Unique, exhilarating and unforgettable, Coasteering will have you traversing the coastline, clambering over rock formations, ducking into hidden caves, climbing up cliffs and leaping in to the sea! 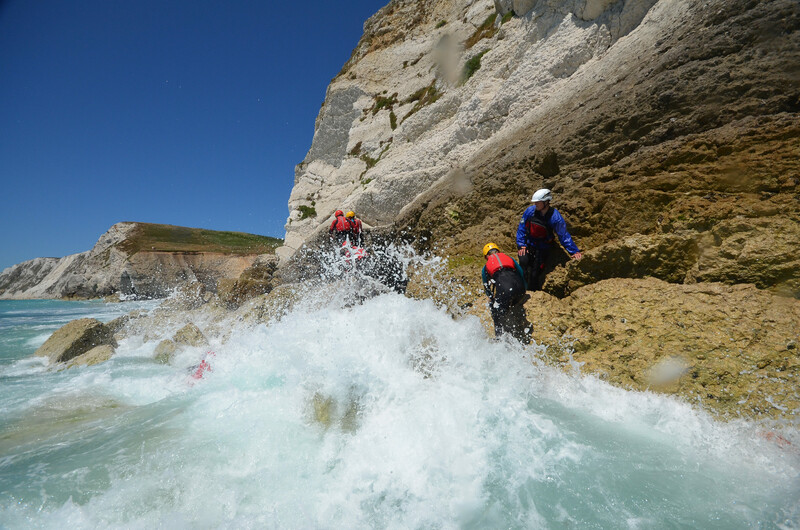 Taking in places along the south-west coast of the Isle of Wight from Freshwater Bay, this exhilerating sport is perfect for groups of all sizes who want to have great fun exploring the more inaccesible parts of the Island's coastline. Jumping over rock archways, swimming through wave filled gaps, climbing up cliffs and ducking under water into invisible caves are just a few of the experiences to be had on this adrenalin filled activity. Get up close and personal with the Isle of Wight’s coastline by taking a coasteering adventure along the edge of the cliffs from Freshwater Bay with Isle of Wight Adventure Activities (IOWAA). Thrilling is definitely what it will be with enormous caves to explore, jumps into underground caverns and the sheer chalk cliffs towering above you. Coasteering will give you experiences that you’re probably never had such as jumping over rock archways, swimming through wave filled gaps, climbing up cliffs and ducking under water into invisible caves. The coastline here has many caves in the chalk cliffs, some of which are only accessible from the sea, so this is chance to see some of the truly secret parts of the Island by scrambling, swimming, crawling and climbing around, across and sometimes through the bottom of the cliffs. 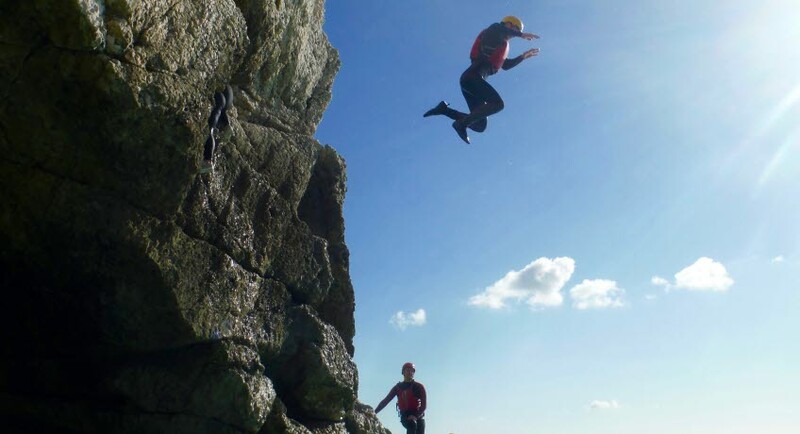 IOWAA’s coasteering adventures are run by qualified outdoor professionals who have a vast experience of the coastal environment and they are licensed by the Adventure Activities Licensing Service (AALS). Owen Burson has been coasteering for the past 20 years, eight of them here, having run coasteering in lots of other parts of the country. He’s also a nominated technical advisor for the sport from the AALS and has trained all of his team, so you know you’re in very experienced and qualified hands. Your adventure begins at the IOWAA base at the Sandpipers Hotel complex in Freshwater Bay where you get kitted up in wet suits, helmets and buoyancy aids. The after a safety briefing it’s a quick walk over the road to the beach and from there it’s out under the cliffs and the excitement starts. There are two ways to go from the bay and to the left it is safer and this is the side that family groups and those with younger children are taken – anyone from age five upwards can have a go. To the right of the bay you will be straight into swimming through caves, jumping into underwater caverns and seeing blowholes at the base of the cliffs. “The sounds that you get are amazing – some caves are very loud and the sound echoes around you and in others it’s like being in a sensory deprivation tank and all you can see is the light reflecting through the water,” explained Owen. “It’s not just an extreme sport, it’s the sights and the sounds and the views – there’s a lot more to it than just jumping off a cliff. “We adapt to our customers and pick a route that’s appropriate to the group we’re taking. Everyone who goes out has a challenge. It is worth remembering, before you decide that it may not be for you, that there is always a route choice – and you won’t be pressured into doing anything you don’t want to. Once back at base you can relax in the garden with a drink from the bar or cafe chatting over who did the biggest jumps, who went deepest into the caves, who got hit by the biggest wave or any number of other things that may happen in this most dynamic of environments.